Sometimes older RAW files have embedded preview images with dimensions much smaller than the RAW file itself. For example, some early cameras included smallish 1200 pixel previews even if the RAW had 3500 or more pixels in each dimension. 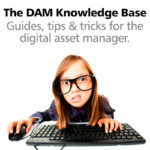 The digital asset management system IMatch by default uses the embedded preview image to produce the thumbnails and cache images. That’s usually a lot faster than extracting and developing the full RAW data. But if the embedded preview is much smaller than the RAW image itself, this may lead to unwanted results and too small images in IMatch (Quick Preview, Viewer, Slide Show). Modern cameras usually embed 100% previews, but older cameras did not. If your image archive managed by IMatch contains files produced by older cameras, you may run into this problem. But there is an easy solution. You can handle this situation easily with the cache preferences in IMatch. Go to Edit > Preferences > Cache to view and configure cache settings. 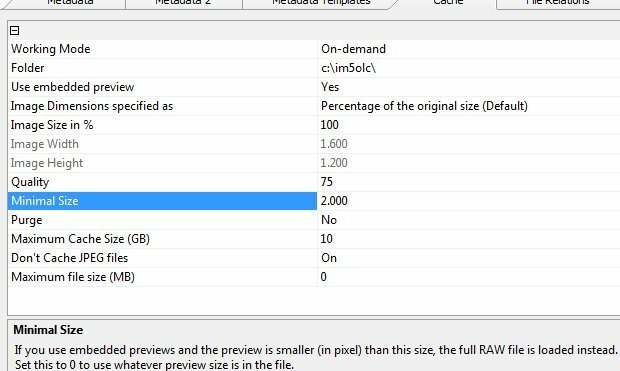 IMatch then uses embedded previews (from your new RAW files with standard 100% size previews) but falls back to developing the full RAW image if the embedded preview is less than 2000 pixel in either dimension. This gives you 100% previews for all your RAW files, old and new. Sometimes the installed WIC Codec is unable to extract the embedded preview. In this case it usually helps to install the most recent WIC codec provided by your camera vendor, or a 3rd party WIC codec. After a few seconds, IMatch displays a text file which lists all installed WIC codecs, the file extensions they support and the results for the selected file. This shows you if the WIC codec was able to extract a thumbnail, a preview and the full RAW image. See also the knowledge base article WIC Support and Codec Availability for more information about WIC codecs.